Last Saturday found me in Memphis, Tennessee at the tail end of an educational conference. My colleagues took advantage of the the opportunity to head off to tour the king’s home, Graceland. I stayed behind for the vigil Mass for the Feast of Christ the King at St. Mary’s parish. From the outside, St. Mary’s is a sturdy, unassuming brick building built along familiar lines. A cornerstone near the front door anchors the parish in 1864, the start of the post-Civil War reconstruction. Classic column-and-arch architecture lends the compact interior the feeling a European cathedral. Fitting, as it was built originally as a German parish. The hand-carved wooden pews, confessional and altar give the space a sense of weight and dignity; the earthly embodiment of the heavenly ideal. There is no denying the beauty of the church and its parishioners are justly proud of having just celebrated the parish’s sesquicentennial. What struck me most — and moved me during my time there — was the sense of community beyond the walls of the church. As I entered, a small group near the front prayed the Rosary. Their public prayers formed a sort of Greek chorus behind my own private prayer before the Mass, reminding me that I am loved by God individually and as part of a larger community. The modest crowd that filtered in was a visible sign of the universality of the Church. Across the world, in thousands of other parishes, hundreds of thousands of people were celebrating the same Mass with the same Liturgy and the same readings. It was comforting and moving, sitting in the company of other believers whom I had never met and would likely never see again; yet sharing the experience of the Eucharist. It was a moment both commonplace and profound. And that, I think, is what I took away from the experience. 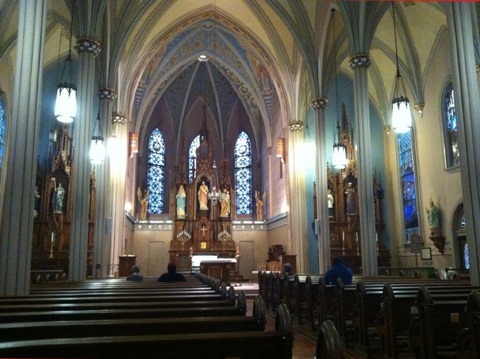 Not the homily (although it was a good homily), not the music, or the readings or even the beauty of the space. The gift I received from the King that day was the simple truth that none of us is alone; we are all pilgrims on a journey toward heaven and there is great comfort in knowing we that none of us is alone. This entry was posted on November 29, 2014 by kevinleec in Essays, Life Events, Spirituality and tagged community, faith, travel.